Congratulations to Solvay graduate, Aruasy Barrios! Congratulations to Solvay Union Free School graduate, Aruasy Barrios! Aruasy was recently featured in the New York State Education Department Office of Bilingual Education and World Languages (OBEWL) newsletter for her work with the English Language Learners (EELs) program while at Solvay. 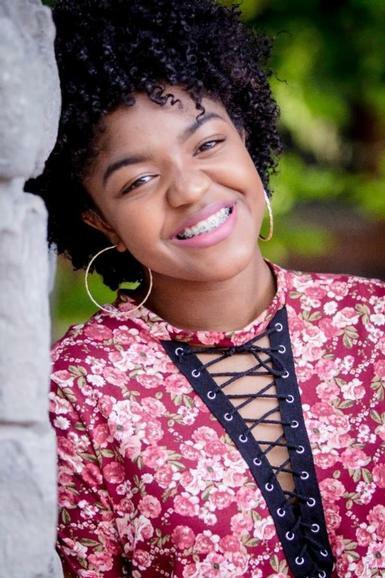 Aruasy graduated in June 2018 with a Seal of Biliteracy in Spanish, English, and American Sign language. Read the article from the NYSED OBEWL Newsletter below, or visit the OBEWL newsletter archives webpage. Former ELLs Making their Mark in New York State! Aruasy Barrios, who recently graduated from Solvay High School with a Seal of Biliteracy in Spanish, English, and American Sign language, knows what it means to be persistent. She says, "Before I stepped foot in Solvay, I had never seen a person who had hearing aids or hearing implants. I was always surrounded by hearing people and my elementary school year was difficult. I didn't get hearing aids until I repeated second grade. After a while, I got used to the curiosity of people seeing a hard of hearing person for the first time. I didn’t take this in a bad way; instead I felt special. But at the end of the day I knew that people would judge me by seeing my hearing aids before I could even utter a word. When I got to Solvay, it was a different story. I met people just like me, [and] I met people who are used to seeing hard of hearing people and were accepting of it. I had a taste of both worlds. I am glad I did. In all my years of being schooled I had a blast. There may have been some downer and unacceptable times but I am proud of the capable lady I became." Aruasy, who was born in Cuba and at four moved to Syracuse with her mother, says she grew up speaking Spanish at home and English at school and "couldn’t be more proud of that." In addition to earning the Seal of Biliteracy, she was on the track teamat Solvay and was a participant in the 2017 Angelo Del Toro Puerto Rican/Hispanic Youth Leadership Institute (PR/HYLI), an innovative collaboration between the NYS Assembly/Senate, the Puerto Rican/Hispanic Task Force, and the OBEWL, with the overall purpose of student empowerment. Aruasy is now majoring in art education at SUNY Potsdam: “As an art teacher, it will be my job to have my students express emotions, thoughts, feelings, and convey a message through art, to teach them to have commitment to their art . . . . Being an art teacher I will try my best to have a connection with my students and being multilingual I already had a head start! I will be able to communicate to children in any of the 3 languages based on their preference. I can teach at a Spanish speaking school, English school, or a deaf school." Tanya Rosado-Barringer, Director of the Mid-State RBERN at OCM BOCES, first learned about Aruasy when the tenth grader applied to PR/HYLI. Aruasy's teachers agreed that she had leadership potential; however, they all felt she needed an opportunity to explore this potential. Despite being shy, Aruasy had an ‘it’ factor that made her special. Aruasy credits PR/HYLI with helping her to become the confident public speaker she is now and advises her fellow ELLs/MLLs to always seek help: “Don’t hide and try to figure it on your own because you're embarrassed or afraid. It’s okay to feel that way.” Aruasy says of her experience at PR/HYLI: "[It] was a very eye opening experience. I had the opportunity to be unified with other Spanish-speaking individuals who had similar cultures as me and stand for what we believed in. The best part was how freely everyone talked about their point of view without having to be called out and judged. When I first went to PR/HYLI I was very timid, I was afraid of public speaking. And PR/HYLI changed the way I perceive things. It made me a stronger person." She says of her Seal of Biliteracy presentation on racial profiling: "It was a difficult topic to talk about because it is something people don’t really talk about everyday. I did not expect to be there presenting more than 10 minutes." When asked how being bilingual/multilingual is an asset in today’s world and what she would say to someone who thinks learning languages other than English is not important, she said, "In today's society being multilingual, gives you a head start. It doesn’t only improve your social skills and create a connection with others, but it also opens up job opportunities and gives you an easier time conversing with people from other cultures. Learning another language is about having a connection with people. It’s a great feeling! Knowing more than one language is really an asset. The main reason it’s an asset is because you get to connect with people who are different from you." We are proud of Aruasy's accomplishments and wish her the best in what is certain to be a bright and promising future!